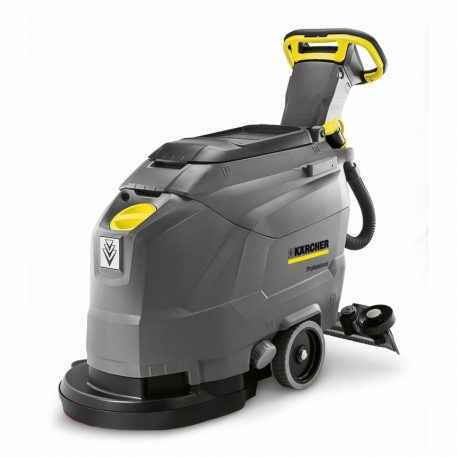 Compact, manoeuvrable, whisper-quiet and easy to operate: these are the outstanding features of the DB 43/25 C walk-behind battery-powered scrubber dryer with disc technology, 43 cm working area and 25 litre tank volume. This machine is ideal for small and very cluttered areas, easy to use and offers a clear view of the area to be cleaned. The BD 43/25 C with EASY-Operation system and yellow control elements is easy to operate also by untrained operators. The machine is also easy to clean. We recommend this machine for efficient basic and maintenance cleaning of areas up to 900 m². Straight or curved squeegees are available and can be ordered separately.